What are the rules on boat speed? There is no speed limit in open water . 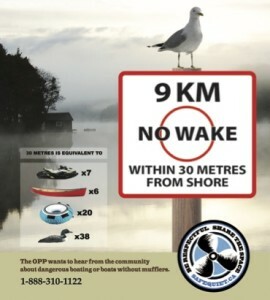 Within 30 metres of shore the limit is 9 km/hr on the Muskoka lakes and 10 km/hr in other areas of the country. This speed limit is designed to minimize the risk to people in or on the water near shore, reduce wake damage and minimize noise disturbance.